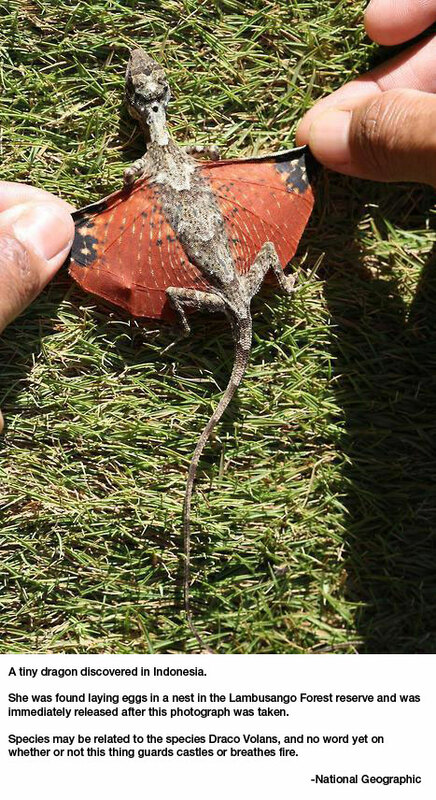 The Flying Dragons are native to the southwest tropical forests of Asia and India, including Borneo and the Philippine Islands. In the wild, the Flying Dragon will generally claim a territory. Usually, males will mark two or three trees as their own, and one to three female Flying Dragons will live in each tree. When the male Flying Dragon meets another animal, he may extend his dewlap partially or fully, extend his wings partially or fully, perform a combination of dewlap or wing extension, or bob his body up and down. If he meets a female, he may circle her. Extending the wings and dewlap makes the Flying Dragon appear larger, and he will usually exhibit such behavior if he feels threatened. Flying Dragons eat insects. They catch such prey by sitting under a tree until an insect passes by, and then they consume it. They have short sticky tongues that they use to eat ants and termites.